One reason given in the original message was the Gospel story of Jesus standing on the mountain top (with Satan) and seeing the whole world (actually, Matthew 4:8 & Luke 4:5 say "all the kingdoms of the world" - which suggests that Jesus got an edited view that omitted the oceans and deserts and jungles). But there is no such mountain top that can see the whole world, nor even all its kingdoms, from the summit - and the easiest evidence of this is that none of us on the ground can see the summit back. So I am inclined to think that, mountain top or not, Jesus was shown a special vision by some supernatural conjuring by Satan, rather than having a natural visual perspective that enabled him to see the whole planet from the top of a mountain. So this is not necessarily evidence for a Flat Earth. If they have used their special ability of vision they did not need to go top of a mountain. It was possible from where they sitting near to the sea. I suggest about 3 places to be that mountain. The edge of a few convex, so the places which called as "south" have positional avantage to see the whole world. It is possible to see whole world on three mountains which are highest points of South America, South Africa or Australia. It is possible on Mounth Townsend, Australia. After that i accept other 2 mountains have possibility. New candidates are Aconcagua Mountain (Argentina) and Drakensberg (South Africa). If we consider Jesus 40 day speed walk under compulsion, before going to the mountain, after some calculations we accept that it is possible to go to South Africa from holly land with a hard walking as a tell in holly books. 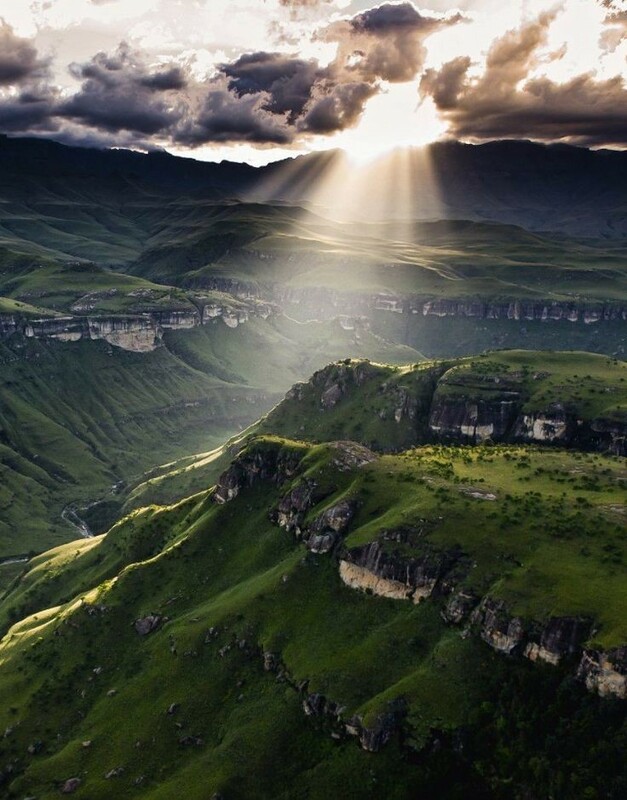 That place is South Africa Drakensberg mountain. Jesus fasted for 40 days as well. I doubt He did any speed walking to another continent and back. Think about that Inki.. So i decided only South Africa is possible. Australia and Chile is impossible but i calculated it as landing from Israel to South Africa with 40 days 8-10 kms/h speed and 16 hours/day walking is possible. Okey i have 2 new candidates for be Jesu's sitten mountain. Why are there? Because there is three places on the edge of the world ship: Australia, South Africa and South America. New candidates are Aconcagua Mountain (Argentina) and Drakensberg (South Africa). Drakensberg has a better chance than other two because with a more effort it is possible to go there from Israel with 40 days. I measured from Israel to South Africa as 5.000 kms. (It can be change a few). If we calculate it, if Jesus a normal man but forced to walk hard; is it possible a man walk 5.000kms/40 days= 125 kms/day. I read an article about how many kilometres a man can walk in a day and read someome claims he walked 100 kms/day. It seems it is possible to walk 5-10 kms/h. If somebody walk a day about 16 hours, it is possible with a speed of 8 kms/hs. I know some of you disappointed, because i started with in an assertive manner but now claiming two other alternatives. I should to do that because my aim is not deceive you; oppositeli i aim to find out the truth together. 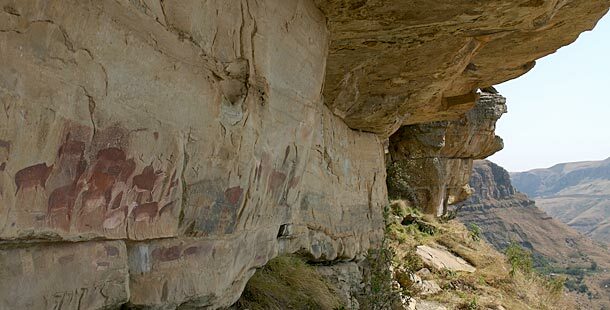 After that, i found some interesting drawings on Drakensberg (South Africa). On the light of these knowledges, i changed my decision to Drakensberg. I'll bring here some graphics which found on the Mounth Drakensberg. I'll add that drawings to the debating OP. This thread really does make round earthers look bad...and extremely angry..
A bunch of you are clearly angry. Googleotomy, you're posting your crap in the Q&A section. If you don't have an FE answer to the questions asked, start a new thread in FE General or Debate. If Satan took Jesus to a mountain top, it may have been just to find a spot where the two of them would not be disturbed by any other people. I certainly cannot see the Australian or South African mountain top from the east coast of the US, and I strenuously doubt someone in Paris or Rome could see either of them either. And I am sure that someone in Australia or Africa who would climb to the summit of either mountain would similarly be unable to see Rome or Paris or any other 'kingdom'. A fairly simple demonstration of the roundness of the earth is the fact that, as one's altitude increases (= the higher you go) one's perspective takes in more of the earth's surface (=the more you see). This can be demonstrated by riding a ferris wheel, or going to the top of a skyscraper, or looking out the window of an airplane as it takes off. Maybe it's a good duck that you only need, unaffected by the atmosphere; which makes your horizon to infinitive. Because it's a simpler model with more predictive capacity. That dkes not sound like a nice request to me. Do you always 'ask nicely' by telling people to shut the f**k up? What does "That dkes not sound" mean? He was thinking of your mom, dyke. The Australian mountain mentioned is Mount Townsend, which is not even the tallest mountain in New South Wales. It cannot even see over the tallest mountain in NSW. It doesn't even make the list of the 200 tallest mountains of the world. So my opinion regarding the story of Jesus and Satan on the mountain top remains unshaken. Is this your #1 reason for believing in flat earth? Flights. Then I have this question, if we live on this oblate spheroid then why doesn't someone just fly over the south pole? Video it the entire time and END the argument? That would prove Antarctica flying from let's say South Atlantic ocean over Antarctica then seeing the Indian ocean or let's say we curve on around to the south pacific. Your response is a bit off topic and I am not going to debate with you over this, but how would you know they simply did not commence the flight near the ice shelf, passed over the ice shelf for a few hours, then exited off the ice shelf at nearly the same spot they entered? It is all white. There are literally millions of pictures and at least dozens of videos proving that the earth is a globe. They are all dismissed as fake. The same would happen with this video. We can debate but that is pointless because it is never ending. People can believe what they please. I just thought I would ask that question. Researching about the shape of earth is what got me thinking. Used to always say FEers were nuts. Yes, I can see why you are "not going to debate with . . . . over this". We would then see just how nonsensical your suggestion really is and how little you know of "your own" Flat Earth. So I have kindly created a thread in the Debate forum for it. I suggest you read it before setting out of your flight of discovery! In future please engage brain before writing a post. Advice we all should follow.